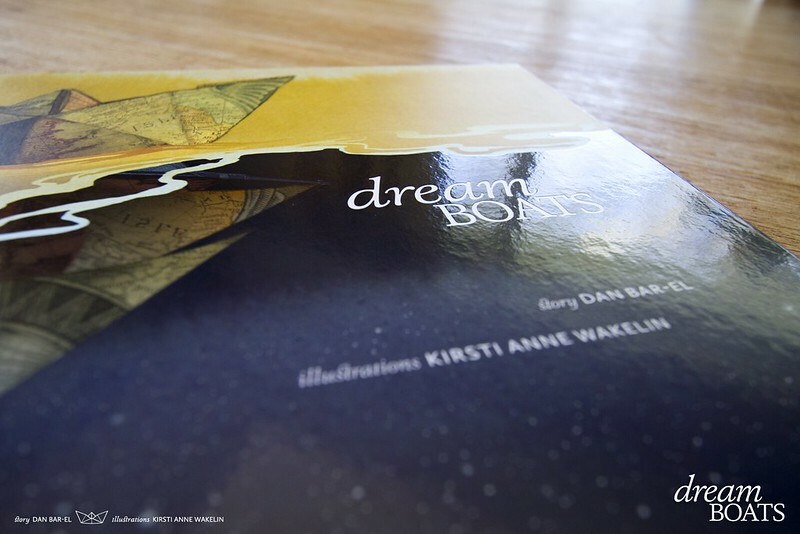 Dream Boats deliberately does not have a dust jacket. It seems opinions are very split on book jackets. Some people love them, some people remove them immediately, shove them in a drawer, recycle them, or pin them up as wall art. At the beginning of the book process I had a nebulous idea of the cover but I had a definite idea about a jacket; I didn’t want one. A big part of my reasoning was my desire to cut down on excessive paper use, especially as this book is longer than the average picture book at 40 pages, the other was that a jacket didn’t fit with the idea I had for the feel of the book. Covers are an incredibly challenging part of the book. 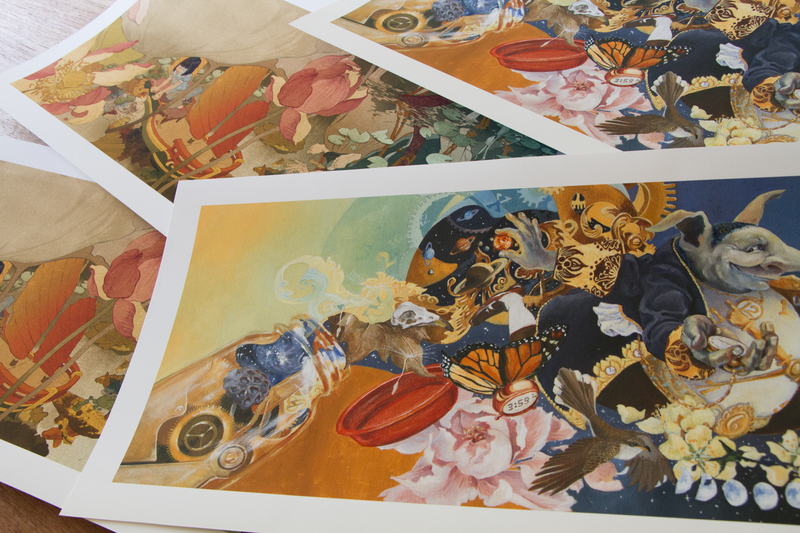 Sometimes a cover uses an interior illustration, and often because a cover image is required really early in the process for marketing purposes, the cover is created first, before all the other artwork – which usually means before the illustrator has had time to really spend time figuring out the the illustrations as a whole, and that can result in cover art that looks stylistically different from the interior artwork. This cover took some figuring out; it wasn’t going to work to use an interior illustration, because the book is full of different stories, about different individuals. Additionally, I knew I couldn’t use one character from within the book, because the book is full of a variety of characters and I also wanted to keep the narrative voice that flows through the book as open as possible to allow a child-listener or reader to inhabit the story as that character. I toyed with the idea of showing a number of boats, with the children left somewhat indistinct, but that didn’t feel right either (plus marketing deemed it too scary [as an aside – I would truly love to illustrate a scary book]). 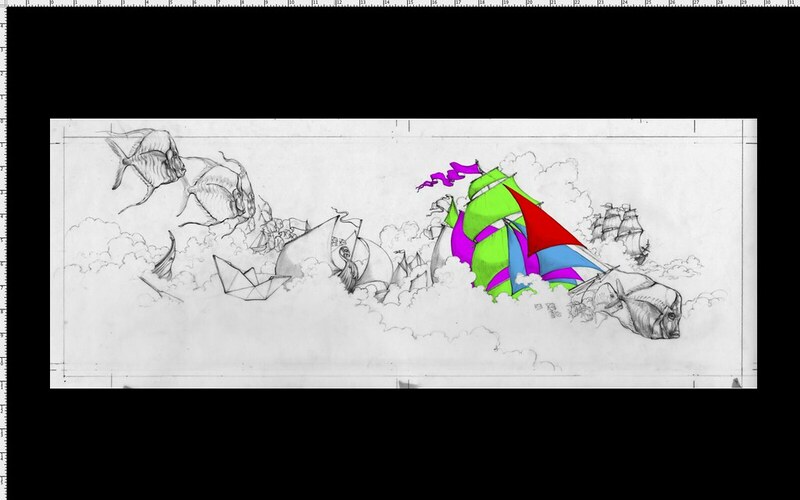 Partway through the illustration process I decided to include a folded boat that would appear on all the narrated pages (more on the narrated pages vs story pages in a later post). In the dreamscapes this boat it is brightly collaged. I decided this was the object-character that needed to be on the cover, and by including a fanciful reflection (or an upside-down glimpse into another world), I could hint at the dreams and magic inside. Additionally, water is an important element within the text, it appears as raindrops, oceans, and rivers, so it also needed to be prominently featured on the cover. The interior illustrations start off quite quietly and build to depictions of densely detailed dreams and adventure, so I felt that a quieter, more contemplative cover was required. I didn’t want to give it all away on the cover. Finally, I designed a varnish for the ‘reflected’ area, to further play up the feeling of water, reflections, or alternative veils of reality.